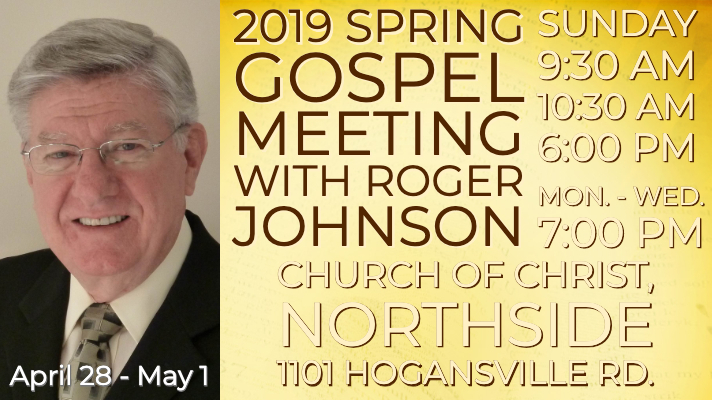 Northside’s 2019 Spring Gospel Meeting begins on Sunday, April 28th. Our speaker this year with be Roger Johnson from Tuscumbia, AL. Roger was formerly the preacher for the Edgewood Church of Christ in Columbus, where he served for over 13 years. He has been preaching the Gospel of Christ for over 55 years in seven states and six countries. He has spoken on many lectureship programs and countless gospel meetings over his long career in the Lord’s service. He is a long-time friend of the Northside congregation. We are thankful to have him for our 2019 Spring Gospel Meeting and to provide the opportunity to meet him and hear the lessons that he will present. We have no doubt that anyone taking advantage of this opportunity to study with Roger will be richly blessed.